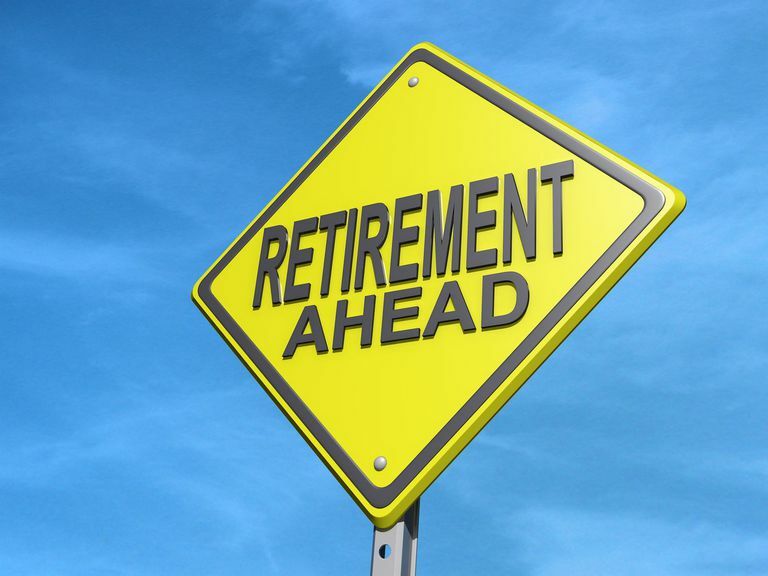 Before I dive into option strategy for retirement accounts, I would like to highlight the importance of 401K participation at your workplace, if one is offered. After all, 401K plans with company matching contributions are the best retirement tool for every employee. So you would think everyone is participating but I've met various people and co-workers throughout my career that are not taking advantage of this tax-deferred retirement plans and leaving "free" money behind from company matching contributions. Life comes at you fast so start contributing and continue to boost your retirement savings whenever possible. I think we can all agree that in general, life tends to get harder as one gets older unless you're well prepared financially for your golden years. This strategy uses your existing equity or stock positions as collateral in case your stock is called away. Hence, the name "covered" calls. A single option contract represents 100 shares of your underlying equity or stock. For example, if you own 100 shares of Apple stock (AAPL), you can write a single covered call contract on Apple stock in the option exchange. By writing or issuing the contract, you're the seller of the option contract. On the other side of the trade, the buyer of your contract, will pay you a premium price which represents the risk you're taking at the time of issuing the contract. The premium price, which is yours to keep, will depend on the strike price, time to expiration, volatility, upcoming dividend payout, and interest rates. As such, this strategy establishes a limit on how much money you can earn from the position. At the same time, it helps buffer you from the downside by the premium amount that you collect at the time of issuing the contract(s). I'll give specific examples and scenarios on how and why I use this strategy in my retirement accounts to help simplify and clarify this option strategy for those that would like to apply this strategy on their retirement accounts. With this strategy, you must have the equivalent "cash" amount in your account to cover the stock assignments in case the underlying equity or stock is In-The-Money at expiration. In-The-Money is when the underlying equity is below the "put" contract strike price that you issued. 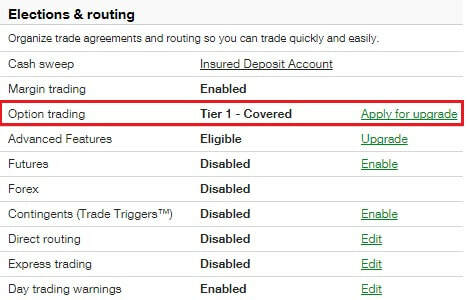 Similar to covered calls, you collect a premium price at the time of issuing the "put" contract(s). If the underlying equity is above your strike price that you issued in your contract(s) at expiration, the option expires worthless and you get to keep the premium amount established at the time of issuing the contract(s). As this strategy required a higher level of authorization from your retirement account brokers, most option strategy for retirement accounts use the covered call strategy, which is what I'll focus on with my specific examples. The example above is dated at the market close on 11/22/2017. If I don't care to own DIS, I'll be a bit more aggressive by selling the $103 vs. $105 option contracts to collect more premium upfront. Covered call strategy is great if you believe there is a potential downside to the stock and you're not willing to close your positions. It's a great strategy that I apply on certain stocks. Once the premium dropped to around 0.20 to 0.25 cents per contract, I'll repeat the process by closing and opening new contracts until eventually the stock is called away. Gold Miner ETF (GDX) -- With the market at an all-time high, GDX or GLD (Gold ETF) can serve as a hedge against market corrections. But mostly I own GDX or GLD for diversification purposes and usually write out covered calls approximately $0.50 above the current price to collect premium. Final Thoughts -- Covered Call is a conservative option strategy that can produce additional revenue in your retirement accounts; can be used to hedge against a potential (slight) downfall in your holdings at market highs; can be used to reduce your cost basis. In the three examples, the covered call strategy worked very well for DIS as the stock is trading mostly down, sideways, or slightly rising. In this scenario, my covered calls worked very well over time (time decay) and I continued to collect premiums to reduce my cost basis. This is also true for the second example in GDX which has been trading sideways for a long while now. The third example is a special case that is part of my "watch" list. This is where option strategy really shines. A big drop in stock price usually causes a corresponding rise in volatility. Reference the TMUS chart below when the stock price took a big hit, its volatility spiked from 25% to 100% as measured against itself over a 12-month period. 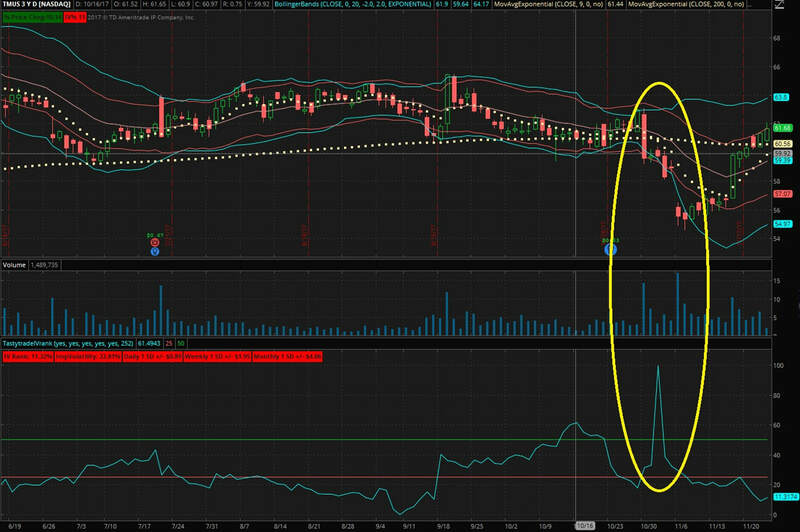 As an option trader (seller), I embrace volatility as the price of premium that I can collect is at its highest. To read one of my blog post on mean reversion of volatility where I was able to make a small profit even when the stock price moved against me by a whopping 18%, click "Volatility Spike and Contraction Illustration". Other posts on volatility "How to Play a Volatility Spike" and "The Volatility Game". Note that some of the options are not very liquid so the bid/ask spread is very wide, making it difficult to enter and exit a position. If you've to enter a trade, be patience and use limit orders. Don't force yourself into writing covered calls if the premium is not there due to low volatility environment. The contents and posts in this website are for informational and knowledge sharing purposes only. I'm not a financial professional, please seek out a professional for financial advice or services.